Haven't been to a game yet this year, but today that is going to change. Going to the Cardinals game this afternoon. Should be a beautiful day. And even if it is not, it is a company sponsored event, so we will be inside. A great way to watch baseball. Lets hope they have a better showing today than last night. 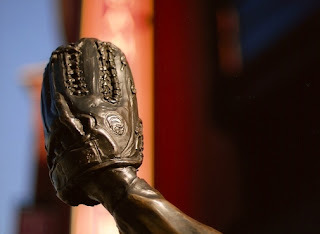 But you can rest assured, no matter the score, no matter that they are in second place in the Central Division, even if they were in last place, the stands will be packed. It is a baseball town! 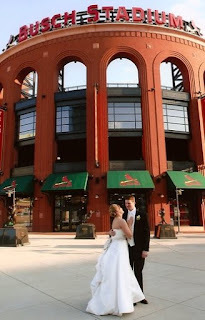 It is such a baseball town, the above photo wasn't taken from the Cardinals website, it wasn't a picture taken from the paper, it is a photo taken during the photo session for my second daughter's wedding. A long standing tradition here in St. Louis is that after the wedding, many couples travel around town to have pictures taken at local landmarks. The Gateway Arch, Forest Park, Busch Stadium, Ted Drewes Frozen Custard. Yes brides have pictures taken at the church, during the reception but there are few that don't include the Arch or the stadium in their photos. Yes it is a baseball town. ps, these photos are good, but they aren't the ones that made the album. We were very blessed to have awesome photographers. Can't wait to see their album which should be finished soon.